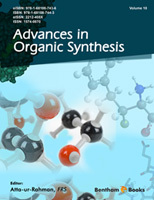 This volume of Advances in Organic Synthesis presents recent exciting developments in synthetic organic chemistry. It covers a range of topics including important researches on novel approaches to the construction of complex organic compounds. The chapters are written by authorities in the field and are mainly focused on organocatalytic α-hydroxylation and α-aminoxylation of carbonyl compounds, Achmatowicz rearrangement derived synthons, synthesis of N-Glycosyl compounds, five and six membered nitrogenates heterocycles and mesoporous SBA-15. The book should prove to be a valuable resource for pharmaceutical scientists and postgraduate students seeking updated and critically important information on recent important developments in synthetic organic chemistry.I hope that the readers will find these reviews valuable and thought-provoking. I am thankful to the efficient team of Bentham Science Publishers especially Dr. Faryal Sami (Assistant Manager), Mr. Shehzad Iqbal Naqvi (Senior Manager) and Mr. Mahmood Alam (Director Publications).